Welcome! And thank you for downloading our fast guide to SEO! 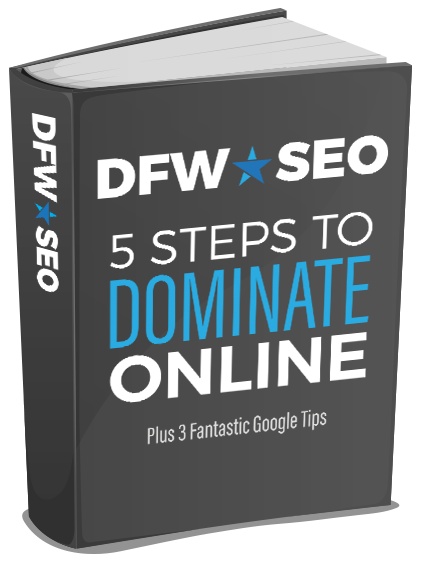 In this guide we will help you discover the five steps it takes to dominate online. We will also reveal three fantastic Google tips that will aid your business in reaching the top of Google’s map listings. SEO is an acronym that stands for Search Engine Optimization. It refers to the steps it takes to push your website to the top of Search Engine Results Pages or SERPs. Simply put, when someone opens up Google, Bing, Yahoo or any search engine, they will begin by typing a query or a set of keywords into the search bar. Pay per click ads can be a great way to jumpstart your business, but they are not a good long term solution as they can quickly become very pricey. Some PPC ads cost as much as $60 per click or more! The first step to dominating online is having a proper website design. Design is critically important to not only being found online, but in capturing your audience and converting leads! Embedded in the design’s code are important clues to Google. Semantic markup for example tells Google what content within your design is important. It keys Google into things like your company name, address, phone number and hours of operation. Each detail of your code matters greatly in ranking high. The architecture of your site also matters. For example, it is important to create content for top level pages and to silo pages of content under these top level pages which contain relevant sub category content. An example of this might be a top level Services page for your business with pages silo’d underneath the Services page that highlight and discuss specific services your business provides. Your Google map listing should be a top priority of your online presence. Setting up your Google listing can be done by visiting www.google.com/places. Once you have reached this web page you can either create a new listing, or work on an existing account. Remember, you should never fabricate reviews, pay anyone to give you a beneficial review or steal reviews from other sites. Because map listings are so critical to your online success, we actually have a dedicated team that works on improving map listings through all of the above ways and more! If your map listing will not improve, talk to us about what may be holding you back. Do NOT miss out on this critical component of your online presence. Sales Pitch: You should include a post each week that promotes a service, or has a call to action. For example you could highlight an upcoming special you are running or post a coupon for a specific service. We have members on our team who spend hours upon hours every week dedicated to ensuring our clients have top notch social profiles. We post on behalf of our clients, constantly ensure their profiles are up to date with the latest relevant information and more. And all of these efforts band together to create an outstanding, well polished online presence. If you are tired of being beat out by your competitors online and you have any questions about our services, please give us a call! We will be happy to assess your online web presence and help you pinpoint the best way to solve your ranking problems. Our clients rank on the first page of Google for countless keywords and you could be next! 1. Be sure to mark your address “hybrid” in your Google Places. The “My Business” section has a check mark for this. If you don’t select this then you may be penalized for being residential if you don’t have a commercial location. You can also choose to make your selection “delivers goods and services” if you are worried about people knowing where you live. By checking this, you are stating that you only deliver your services and goods to your clients locations and that they cannot visit your physical location. This might apply to someone such as a law enforcement officer. However, for most local small businesses it is unnecessary. 2. Get Google reviews. We know you have heard this, but you simply will not do as well without reviews. This will help you show up on mapping as well as organic rankings. Working hard on your Google Search Console, Google Plus, Google My Business, Google Analytics etc… is a huge advantage, but without reviews you simply will not show as well. 3. Take your business pictures of jobs etc… and upload them to your Google My Business account. Then, write one or two sentences about each picture and make them public. This will add to your knowledge graph, content and overall success of your Google account which improves your mapping and organic rankings. It also aids in Google liking you better which will result in more clicks and business for you. We hope this guide has been helpful and remember, our team is ready to help you dominate online! We can handle every single detail of your online web presence and by using our revolutionary tactics, we can help you dominate over your competition. You can get started with us right away, today! Click the 5 Steps To Dominate Online free PDF! Updated on June 30, 2017 at 7:29 pm by Dallas / Fort Worth SEO.